Best Chinese Knives: The One Knives Channel Construction BM40 BM42 Balisongs - Best choice for inexpensive balisong knife! The One Knives Channel Construction BM40 BM42 Balisongs - Best choice for inexpensive balisong knife! 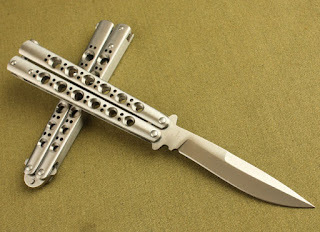 I've been asked by a lot of people - where can I buy a good quality, but affordable balisong (butterfly knife). I can tell you with confidence, that the best, based on this criteria are knives made by The One, a Chinese brand that specializes on balisong knives. I had one of his blades (BM42 version) and I was really impressed by the quality level. It has channel construction (solid mileed steel handles), spring latch, bronze washers, which enable smooth flip and even comes with a sheath and a torx screwdriver for adjustment. For a sharp version make the order, but don't pay! Leave the seller a message that you want a sharp version, he will adjust the price (it costs 18$), and then complete the purchase. Got one in the mail today. I played with it a bit and I must say that this was money well spent. Solid construction, smooth movement, pretty good value for the money. Thank you for the tip!